Every four years, the world's attention turns to the FIFA World Cup - a magnificent spectacle and a celebration of the world's game. From all corners of the globe, thirty-two nations supported by millions of fans join together and chase the most famous trophy in sport. In 2010, the world's largest sporting event is coming to South Africa; a historic moment sure to inspire an entire continent and reveal a new side of Africa to the rest of the world. Kickabout was born of a desire to bear witness to this incredible experience and of a belief that the FIFA World Cup in Africa provides a unique opportunity to help those that help others. Football is more than a game in Africa. It is a source of immense national passion and pride and, at the same time, a unifying force on the most diverse continent on the planet. From Senegal to Somalia, from Egypt to South Africa, football is the link that spans political divides, bridges religious differences, and brings together people with nothing in common except a love for the beautiful game. Football in Africa goes beyond even that. For the better part of a half-century, organizations, communities, and dedicated individuals have worked to harness the power of football to fight disease, ensure equal access to education, empower the disadvantaged, protect the environment, heal those affected by war and violence, and promote economic development. 3) Support for the most courageous and innovative sport and development projects in Africa. The game plan is simple. 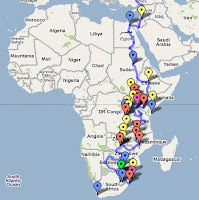 A team of six individuals will overland from the UK to South Africa, visiting as many countries and communities as possible. With boots on and footballs in hand, we do what we can to help those that selflessly serve others to build a better today and a better tomorrow. Working with Kickabout Signature Partners – Coaches Across Continents, Grassroot Soccer and Right To Play - we'll visit some of the innovative and successful sport for development projects in Africa and organize community matches, free clinics, and football festivals. We'll also search out, discover, and highlight those local and grassroots projects that do not have international recognition, but need and deserve support. Along the way, we’ll use a variety of media and outreach platforms to not only tell our story but to also turn inspiration into action. 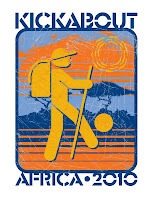 In partnership with Plus 3 Network, Kickabout will motivate our friends and fans to get out there and get active on their own Kickabout 2010 expedition.